Here at Haemoglobin Towers there is much whirring and clanking as the finishing touches are put to your favourite book of the year, the annual Hooting Yard paperback. The publication of this mighty tome is imminent, imminent I tell you! 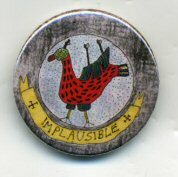 Meanwhile, never resting on our laurels, and determined always to extend our global reach, possibly into extraterrestrial zones, the thought occurred to present one of the new and gorgeous Hooting Yard lapel accoutrements to a living luminary. This lucky luminary could then act as our ambassador when hobnobbing with the great and good and with that Fry person. But upon which luminary should we bestow this signal honour? Readers, you decide! I’ve never heard of any of those people, so I voted for the one with the most arresting name. I trust that vote went to the one real luminary on the list (the others being mere impostors anagrammatised from the titles of as-yet unwritten Hooting Yard pieces: ‘Nation Bloated’, ‘Main Epithet’, ‘Sad Bell’, ‘Fauna Fainting-Horn’ and ‘Hurry, Maturing Hunks’).